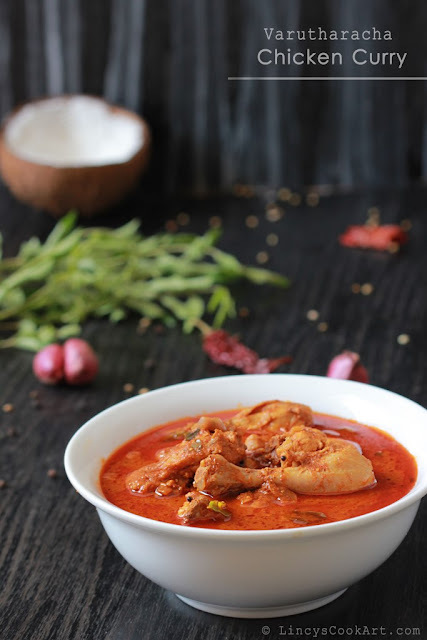 'Varutharacha Kozhi Curry' or 'Varutharacha Chicken Curry' or 'Chicken Varutha Curry' all refers the Nadan Kerala style chicken curry prepared using roasted and ground spices and coconut based gravy. This is a flavourful and also a tasty preparation with the roasted flavour. This tasty chicken curry has more gravy when compare to other chicken preparations and the gravy is really tasty with prefect consistency. 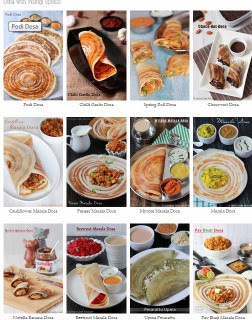 So you could serve more people and this curry goes well with almost all types of Indian main courses like rice, roti, appam, puttu..etc. When you prepare this curry your whole apartment could realise the taste and flavour of the curry. You could adjust the spice level by adjusting the red chillies and peppercorns added. Try this chicken curry for this weekend and let me know the results! Clean the chicken and cut them in to medium sized pieces and rinse them using water for 3 times. Add the chicken pieces with salt and mix well. Now add the ground masala paste whole lot and 3-4 cups of water to dilute the curry till you get a thin gravy. Add salt to balance the taste. Allow the gravy to boil well for about 5 minutes. Now reduce the flame and cook for further 5 minutes or more till you get the chicken cooked nice and soft and the curry gets nice taste and flavour and consistency. The curry should not be thick. The good things about this curry is, this preparation has more gravy when compare to other chicken curries and from the gravy the water content will not separate on top when you keep it as such. Note: Health conscious people could use refined oil to prepare this curry. Use coconut oil to get more flavour in nadan Kerala style. In this chicken curry there is no souring agents used as it is a traditional recipe. If you like little sourness in curry add a small tomato after the ginger garlic. I used Kashmiri red chillies for more colour and less spicy curry if you use normal red chillies the colour of the curry will slightly vary. Beautiful presentation and yummy recipe!Its very tempting curry!